Gyeon is one of those manufacturers of products that seems to be able to continually develop high-end, high quality goods. It’s a name that we are all very much familiar with, and there are regular posts in the showroom with Professionals using Gyeon as their preferred product. Have a look at http://gyeonquartz.com/ for the full range of products. There’s a fairly comprehensive selection of Marine products too. One thing about the Gyeon range, is their very distinctive packaging. The bottles have an angular effect, giving a similar appearance as that of a Quartz Crystal. I actually really like that branding consistency. The Gyeon Q2 Tire was supplied in a 400ml clear plastic bottle, which has the little PET recycle stamp on the bottom. 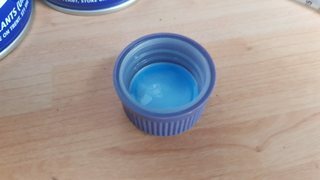 The product itself is a thick, dark blue liquid, with a very pleasant lemonade (I could be miskaten) chemical scent. The bottle came with a screw top, which is a bit of a bug-bear of mine, so I replaced it with a little pop-up lid that restricts the flow of product. The website does show a pump dispenser, perhaps it was an oversight. No biggy though. 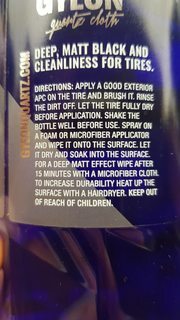 There are very clear application instructions on the label, along with some background information relating to the product ingredients. There’s also a small safety leaflet attached to the bottle too. It’s a fine looking bottle, and has Gyeon embossed into the plastic. Q² Tire not only protects tires, it also improves their looks, making their wall seem factory fresh, with profoundly vivid colours. The visual effect lasts even after detornation of the hydrophobicity. 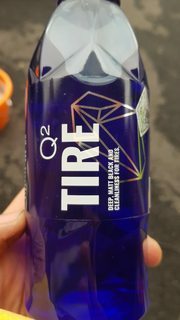 Q² Tire is brilliantly efficient in repelling dirt and is a product which endures at least a couple of washes. It stays on even when applying water under pressure, while its ability to penetrate into the rubber structure ensures that is keeps its effects visible for a long time. For a deep matte effect, wipe after 15 minutes with a microfibre cloth. As with any of my reviews, one thing I do to ensure consistency, is to follow the instructions to the letter. So, after having had a good read, I got going. 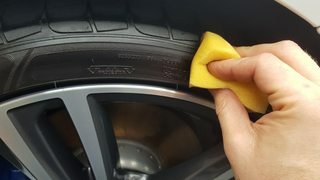 First thing first, was to make sure the tyres were clean. APC was applied liberally, and the tyres scrubbed. And then rinsed with an open hose. 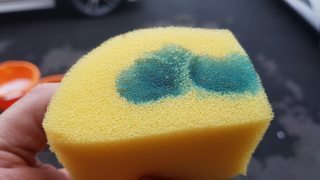 Generally speaking, I usually dispose of applicators after applying tyre products, so my choice of weapon is usually a cut up sponge. 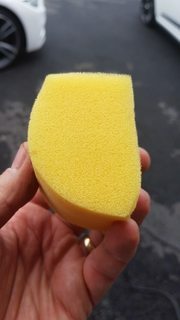 Product applied to sponge, it’s actually a nice consistency, thick enough to decant, but runny enough to work into the crevaces on the tyre wall. And applied to a dry tyre. The product was allowed to sit for 15 mins, and buffed lightly with a microfibre. The finish here wasn’t as matte as I was expecting, but I was very happy nonetheless, as I do like my tyres to be slightly glossy. The next day, I took a pic, just to see how well the dressing had settled. 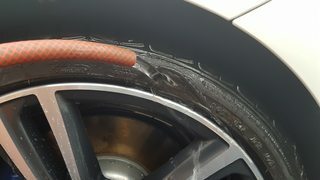 It has left a nice, deep finish to the tyre. 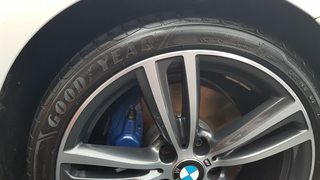 Now, one thing I also did, was apply the Gyeon Q2 Tire to my wife’s DS3. She does far more miles in her car than my 3 series does, so I was interested to see how the Q2 Tire would hold up to a 50 mile commute each day. After a week, and just over 300 miles, I gave her car a wash, and after drying, I took this pic. Q2 Tire still seemed to be doing its thing really well. https://www.cleanandshiny.co.uk/coll...nt=33709802311 for £12.99 for 400ml. Clean and Shiny currently also provides free UK shipping (including NI which is nice) on all orders over £50. See https://www.cleanandshiny.co.uk/pages/delivery-info for further detail. Definitely. A really excellent product. 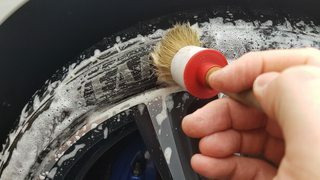 One thing I always loved doing, even back many years ago when I started cleaning cars as a youngster, was making the tyres look dressed. To me, it’s one thing that really can make a car stand out. 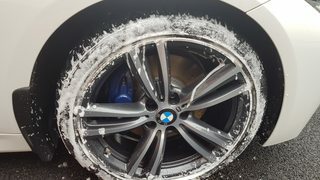 Gyeon Q2 Tire just works well. Simple. It’s easy to apply, and it lasts. 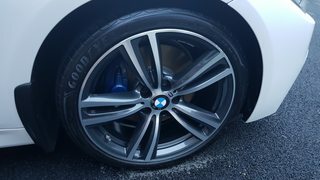 The tyres on our cars had a nicely semi-glossed finish, which I really liked. This is one I’ll definitely keep using. "Detailingworld™ reviewer has followed the Manufacturer’s Instructions and accepts no responsibility to any circumstances arising from any member using these products or following this test "